It’s all too common, a big athletic dog suddenly comes back from the park limping, or even holding up the hind leg completely. You end up at the veterinarian’s office, where you are told your dog has just injured its ACL. The cruciate ligaments are located in the knee (or stifle in animals). These ligaments are vital for proper movement of the knee. The term “cruciate” implies there are two ligaments that form an ‘X.’ The cranial and caudal ligaments do just this and normally function to stabilize the knee so the shinbone (tibia) doesn’t slide back front to back in relation to the thigh bone (femur). One big difference between veterinary and human cruciate injuries is that human cruciate ruptures tend to be due to traumatic injuries, such as, playing sports. In animals this isn’t always the case, which is another good reason it’s often a good idea to look into insurance for dogs. While some may occur as the result of some injury, such as after chasing a Frisbee, 75% of cases are thought to be due to congenital predisposition (genetics) or degeneration in the stifle. Obesity is a huge predisposing factor! Breeds prone to this condition include the Labrador Retriever, Golden Retriever, Rottweiler, and St. Bernard among others. Due to the degenerative nature of cruciate disease, between 30-40% of dogs will go on to eventually injure the other knee. This is due to increased weight bearing on the ‘good’ knee while the dog is lame, combined by the fact that the knees are generally symmetrical. Thus, an underlying predisposing problem in one knee will undoubtedly be present in the other. There are basically four ways of treating a torn or ruptured cruciate ligament, three of these are surgical and can be quite costly; dog health insurance can often help to reduce these costs. Non-surgical treatment is only ever considered in pets weighing less than 15 pounds. Even in these smaller pets this is generally unrewarding and typically fails. About 50% of cats and 20-to 25% of dogs may respond to strict cage rest, weight control and pain relievers. There are several companies that are making orthopedic knee braces for dogs. Although some dog insurance companies might cover the cost of these types of braces, most people agree that they are cumbersome to put on and difficult to keep on the patient. They also are not a long term solution, as the amount of stability provided isn’t sufficient for healing. A permanent surgical correction is a better option, although braces may be suitable for post-operative rehabilitation. The majority of pets need to have surgical correction to provide return to normal function of the leg. 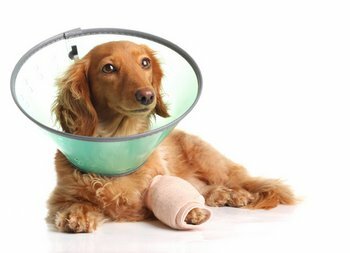 Surgery is generally expensive and dog health insurance can often come in handy. There are three main types of surgical repair. Your veterinarian should help you decide which is appropriate for your pet. A Lateral Stabilizing procedure, also called a ‘Tight Rope’ or ‘Fishing Line’ procedure is generally less costly and can be a good choice for dogs weighing up to 40 or 50 pounds. This implant approximates the position and plane of the torn cruciate, providing stability. In people a graft can be used to replace the ligament, but this doesn’t provide long term stability in dogs and has fallen out of favor. Success rate is about 85% with surgical correction. A TPLO, or Tibial Plateau Leveling Osteotomy is another common type of surgical repair. Smaller dogs may not be good candidates for this type of surgery due to the size of the surgical implant. This surgery is different from the lateral stabilizing surgery because it changes the biomechanics of the knee, negating the need for the cranial cruciate. It alters the slope of the top of the shinbone (tibia) to neutralize the forward motion of the shinbone in the absence of an intact cruciate ligament. A TTA, or Tibial Tuberosity Advancement, has a similar goal to alter the biomechanics of the knee, and can be another excellent choice for surgical repair. Studies show that regardless of the surgery type, the TPLO or TTA surgeries appear to be associated with better results and less degenerative joint disease in very large dogs than the Lateral Stabilizing procedure. There are some things you can do to prevent this type of injury. If you have a larger dog, or any pet for that matter, consider having dog insurance prior to any problems occurring. Don’t let your pets become obese, monitoring treats and people food is essential. Regular check ups with your veterinarian can help you to determine if your pet is getting too heavy. If you are concerned your pet may have a torn cruciate ligament, schedule an appointment with your veterinarian. *Pets Best Insurance does not cover cruciate injuries within in the first 12 months of coverage. After 12 months, regular benefits will apply to cruciate injures that develop after the first year of coverage.